This self-drive tour is for independent-minded travelers who would enjoy discovering the "hidden" Portugal with its many historical monuments, quaint villages, winding roads, steep sea-side cliffs, walled towns, estates and farmsteads dotted around the ever-changing countryside. 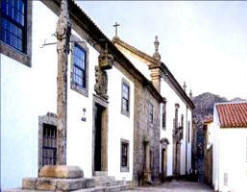 The Pousadas are typical historical inns reflecting the style and traditions of each region of Portugal. Some of them are converted castles or ancient monasteries where every block of stone speaks of history. Flying into Lisbon. Upon arrival P/U your car from Budget car-hire desk at Lisbon Airport and drive West of Lisbon to Queluz and stay at Pousada D. Maria, Summer Palace of the kings of Portugal in the 18th century. The building was formerly used by the Royal Guard of the Court in the Palace of Queluz, known as the “Portuguese Versailles” Stay 2nts there to explore the Lisbon and romantic Sintra with its monuments. Lisbon, beautiful town, visit its monuments, the medieval quarters of Alfama and Mouraria, walk along the typical streets of Bairro Alto and Madragoa and take the opportunity to dinner in one typical Fado Restaurants of the area and enjoy this unique experience. Driving to the South, trough the Coast, the most south westerly village in the Algarve region, overlooking the deep Atlantic Ocean, the Village of Sagres with an important historical and maritime significance, from where 500 years ago, Prince D. Henrique`s caravels left to look for news countries. Lagos – a town with a well preserved heritage. Overnight: Pousada do Infante in Sagres. Driving north to the centre of Alentejo region, region known for its wide open spaces, where can see the extensive farms in the centre of Alentejo is Évora, a museum town retaining much of its medieval and Moorish charm now a Unesco World Heritage and some of the sights not to be missed are the Giraldo square, the Roman Temple, the 12th century Cathedral and the São Francisco Church, one of the most important Gothic Manueline monuments in the area and which houses the famous Chapel of the Bones. Monsaraz – the fortified town, one of the most typical medieval towns in the Alentejo, totally surrounded by walls. Vila Viçosa – with a magnificent ducal Palace, which served as a summer residence for the last kings of Portugal. Estremoz – the medieval Estremoz surrounded by 17th century fortifications. The medieval upper town is set within sturdy ramparts and dominated by a 27-metre-high marble keep called the Torre das Três Coroas (the Tower of the Three Crowns). Built in 1539, the church of the Misericórdia located on Estremoz's large market square was once a convent of the Knights of Malta. Drive to the Blue Coast located on the South bank of the river Tagus. In Setúbal, contemplate the Sado estuary from the top of the São Filipe castle-fortress, that was constructed in 1590 to defend the port from passing marauders. The town of Setúbal is attractive with pedestrian streets and gardens. The 16th Century Cathedral Santa Maria da Graça has glorious tiles from the 18th Century. The Igreja de Jesus is a remarkable Gothic church with interior columns carved in Arrábida pink stone from the nearby quarry. Overnight: Pousada Pousada Palmela in Palmela, near Setubal. 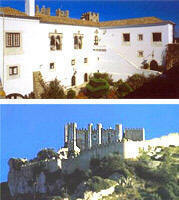 it is a former Mootrish castle near the Ado estuary and the magical and majestic Mountain of Arrábida. Sleep in a place whose initial occupation dates back to 300 years BC.and feel like a real knight in the ancient castle, fortified by the Moors between the eighth and ninth centuries. Travel back to Lisbon and return your car either to meet your return flight or extend your holidays. Check out our Northern Portugal tours. *New NWE Non- deductible in case of self -caused damages for group AB and C vehicles. To avoid this you can buy an additional insurance locally.Budget/Avis general conditions apply.